As I mentioned in my previous post, my wife, a couple of dear friends, and I just returned from a short trip in which we made our way from France to Ireland, via London. My fascination with motorized vehicles of all sorts was stoked continuously with the sight of all sorts of cars, trucks and two and three-wheeled machines that you don’t just see over here. In contrast to the soft, romantic lines of the tiny Vespa scooter I shot on a Paris sidewalk and published here a couple of days ago, I present this Volvo semi tractor (“articulated lorry”) slumbering with three wheels on a sidewalk on a gritty side street in Dublin. 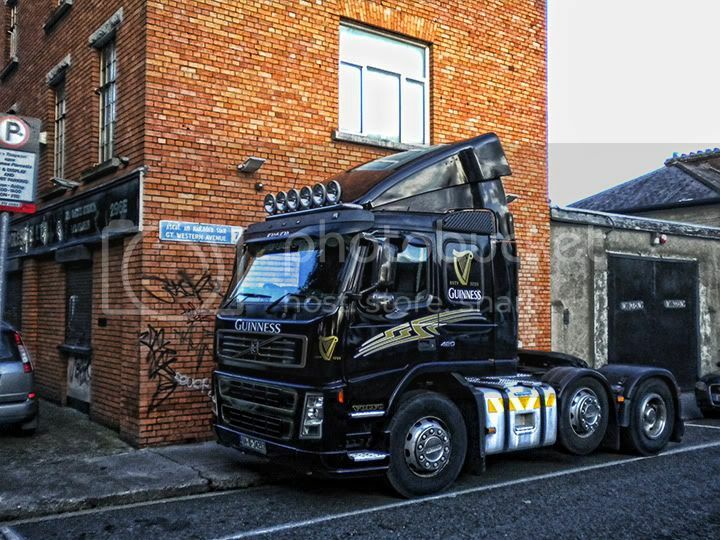 Obviously, the Guinness livery drew me to this particular rig. I am hardly an expert on semis (or “artics”), but I was compelled to do a little research and found that these “cab over” Volvo trucks are not sold here in the U.S. They’re used in European countries because it’s easier to maneuver them through the narrow city streets. Volvo trucks are sold here, but only what the Brits call an “American cab”, where the driver sits behind the engine and its phalanx-like hood. I was struck that virtually every semi tractor I saw in Ireland was equipped with enough candlepower across its roof to melt Irish crystal at a kilometer away. I never did any driving through the countryside after dark, but these things must look like flaming dragons flying over the hills and into the deep green valleys. That could probably the largest truck I have seen on the net. Or could be more bigger if I saw it on person. Check out the mods, really cool looking. Any engine specs?